This week saw the release of the OST of the much awaited period drama Baadshaho (Kings). The film is a multi starrer that features Ajay Devgn, Ileana D’Cruz, Emraan Hashmi, Esha Gupta and Vidyut Jammal. Baadshaho, directed by Milan Luthria (Once Upon a Time in Mumbai and The Dirty Picture) and is slated for release on 1st September. It has been a long while that a film, with such a star filled cast, looks as promising as Baadshaho. The film’s story takes us to the emergency era of 1975, when there was political unrest in the country. When Rani Gitanjali’s (Ileana) palace in Jaipur is raided for gold, she is arrested for withholding it without declaration. What follows is a story that takes us through a thrilling journey between Jaipur and Delhi, along with various obstacles, secrets and revelations. The Milan Luthria and Ajay Devgn-Emraan Hashmi combo is much appreciated after Once Upon a Time in Mumbai. The soundtrack has songs from Tanishk Bagchi, Abhijit Vaghani and Ankit Tiwari and has lyrics by Manoj Muntashir, so let’s see how the soundtrack fares! The album opens with the already popular Mere Rashke Qamar. Coincidentally, this soundtrack features not one, but two recreated tracks, which is no surprise, considering both the film and music are produced by T-Series. ‘Mere Rashke Qamar’ is a wonderful qawwali that was intially penned and sung by Nusrat Fateh Ali Khan and has been given a makeover with his nephew Rahat Fateh Ali Khan on the vocals. The songs additional lyrics, have been written by popular lyricist Manoj Muntashir and the music has been recreated by upcoming composer Tanishk Bagchi. Undoubtedly, this is my most favourite track from the album as I do love a soulful, romantic and melodious qawwali. The song has been picturised on Ajay Devgn and Ileana D’Cruz and something about its promo reminds me of the old-fashioned romance, which has been missing in Bollywood. There are three versions of this track, including a remix and the second is a female version which has been sung by Tulsi Kumar. Seeing as this kind of song is not typically her genre, she has done well on the vocal front. I do feel the remix of this track could have been avoided. Moving on to the next track which is Piya More. Ankit Tiwari makes an appearance on the album as the composer with this one, and he has delivered a quintessential item song. This is also reflected in the songs promo, as for the first time, we see Emraan Hashmi opposite Sunny Leone. Singers Neeti Mohan and Mika Singh lend their vocals to the song, and I do believe that it is the first time they both are singing for Emraan and Sunny respectively. Neeti stands out the most, excelling even in this genre of song while Mika supports her well. Ankit has given some catchy beats and overall, it is a likeable number. The third track from the album is the recreated version of the Kishore Kumar retro classic ‘Kehdu Tumhe’, which has been renamed as Socha Hai. Popular singers Jubin Nautiyal and Neeti Mohan feature on this track, and Manoj Muntashir provides the additional lyrics, while Abhijit Vagani gives the recreated music. One can tell this is a fun track from the opening lines, and Jubin croons the song very well. Neeti has more spoken dialogues than singing in the song, and so we get to hear another side of her vocal quality. The whistling parts are the only downside of the song, as they are a bit too repetitive. There is a second version of the song, aptly titled ‘love version’ and this too, brings out a different side of the song, which is picturised on Emraan Hashmi and Esha Gupta. Hoshiyar Rehna, is the fourth track of the album, and somewhat doesn’t fit in with the rest of the soundtrack. If feels like this song will be played mostly in the background of the film, and sounds very folk like. It has been composed by newcomer Neeraj Arya’s Kabir cafe. Sadly, it is one of the skippable tracks of the album. Overall, I have to say that I expected a lot more from the Baadshaho soundtrack. It does seem that music is not going to be the main focus of the film, and so the weight of the album depends entirely on the two recreated tracks. The soundtrack does not fare well in comparison to Once Upon a Time in Mumbai, which had stand out tracks like ‘Ishq Sufiyana’, ‘Pee Loon’ and ‘Tum Jo Aaye’. 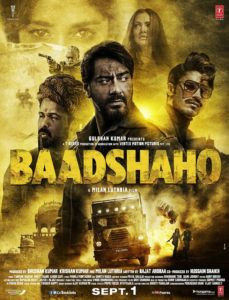 My top picks from Baadshaho are ‘Mere Rashke Qamar’ and ‘Socha Hai’.